Rush Theta Chi Fraternity Today! For over 150 years, Theta Chi's have enjoyed fellowship and brotherhood together as leaders, scholars, teachers, fathers and more. Our fraternity was formed so like-minded collegiate men could have a place to connect, support each other and have fun. Times may have changed, but the aims of the Fraternity, as laid out by our Founders, remain the same. When you join Theta Chi, you’re not just joining a chapter at your school. You’re joining a lifelong network of more than 175,000 brothers, all working together to help you be and do your best. We look out for each other-- you’re never alone with Theta Chi. Attendance at all private fraternity events and rituals. Hayrack, Formal, Semi-Formal, golf tournaments. etc. Attendance at all social parties and sorority exchange events. Immediate participation in intramural sports and other competitive Greek events. Alumnus and Undergraduate Brothers currently employed at Union Pacific, Con Agra, Omaha Fire Department, Omaha Police Department, Douglas County Attorney's Office, PayPal, T.D. Ameritrade, Douglas County District Court Clerk, Universal Hospital Services, InterPublic Group, Yahoo, Carson Wealth Management, First National Bank of Omaha, Apple, Inc., SkyVu Entertainment, Inc., Hyatt, Marriott, Omaha Public Schools, Westside Public Schools, Expedia, University of Nebraska Medical Center, etc. Attendance at international fraternity conventions and meetings. The pledge process for Theta Chi Fraternity is an eight week process requiring attendance at one pledge meeting per week. The eight week process includes two public ritual events - Pinning and Big Brother - for which the Chapter openly invites family members and friends of the Pledges to observe our public ritual. During the eighth and final week of the pledge process, the Chapter celebrates and welcomes the new members with a different event every night of "I-Week," leading up to the Initiation of the New Members. On the evening of Initiation, Brothers and Alumni get together for dinner and the Initiation event, and officially welcome pledges to the Brotherhood of Theta Chi. Theta Chi has a strict policy against hazing during any part of the fraternal experience. If you are concerned about hazing or have any questions related to hazing, feel free to call our Theta Chi Anti-Hazing Hotline at 1-855-824-4840. Egg-A-Chi - Philanthropy event benefiting various charity and service organizations, including the USO. 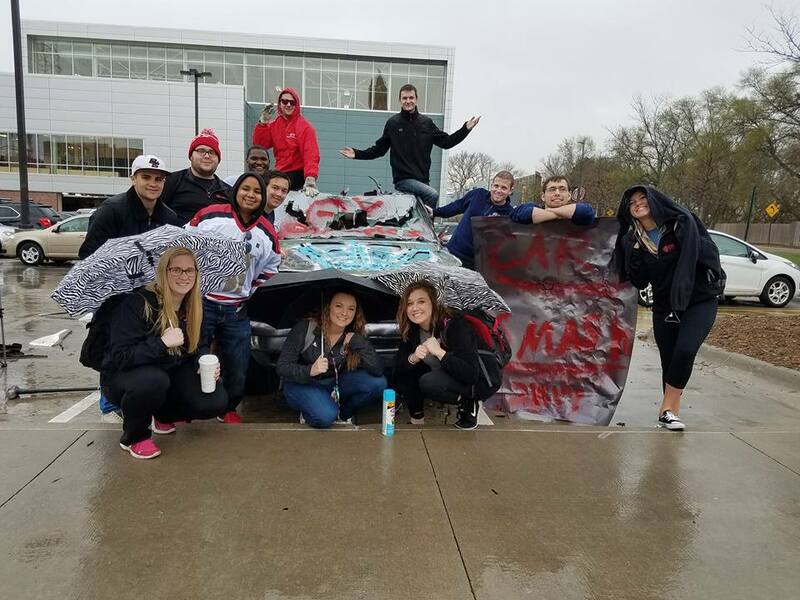 Theta Chi Car Smash - Annual Chapter fundraiser. Theta Chi Semi-Formal - Winter Semi-Formal Event for the Chapter to celebrate the end of 1st Semester. Theta Chi Formal - Spring Formal Event for the Chapter to celebrate the end of the 2nd semester. Alumni Golf Tournament - Golf outing hosted by the Alumni every Fall. Rush Interest Form - if you are interested in joining Theta Chi Fraternity at the University of Nebraska at Omaha, please fill out the form provided below and a Theta Chi Brother will be in touch with you shortly. Thank you for submitting your Rush Interest Form! The Recruitment Officer or a Chapter-selected Member will be in touch with you shortly.